The Sound of Music is a 1959 Broadway musical by Richard Rodgers. 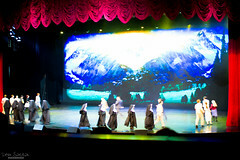 Resorts World Manila started production of this musical in October, at their brand new 1,500 seater performing arts theater. The musical was inspired by the true story of a WWI naval war hero, Georg von Trapp, and his family's journey through the loss of a spouse, a second marriage and a second world war. The near 3 hour musical focuses on first the developing love story of Georg and Maria, and then highlights the Trapp family's musical act that made them famous around the world. And then finally, their struggle against the Nazis and their escape away from their native home of Austria, which was annexed by the Germans in 1938. While this didn't take away from the outstanding performance of the cast in portraying this classic, I felt there were too many "attendants" with LED flash lights roaming around the theater. What in the world are they looking for? Folks filming this with their cell phones? If you are near Metro Manila and want to add some cultural depth to your weekend activities, I'd recommend the Sound of Music. I heard from a Filipino friend that this production was pretty good. It makes me envious that I'm not able to see this.